Seashore Cottage is a brand new oceanfront vacation rental just now being introduced to the market. It is a beautiful two-bedroom three bath cottage located right at the water's edge of Southwest Harbor. At high tide, the water actually reaches under the deck for the ultimate waterfront environment. Relaxing on the deck or inside the cottage provides the most majestic views on Mount Desert Island and the Maine coast. Pine Bluff accommodates up to eight guests in 3 bedrooms plus 2 baths. The second floor bedroom has a king and a trundle, twin under a twin. There are two bedrooms on the first floor, one with a queen bed and the other with two twins. Homeport is a 3 bedroom 2 bath cottage at the water's edge overlooking Bass Harbor, a classic Maine fishing village. You can watch the boats come and go from the deck or explore the little island off the shore from this comfortable vacation home. Sea Breezes, formerly known as Cohen Cottage, is an elegant two bedroom three bath cottage literally at the water's edge at high tide. Sea Breezes is located on a tidal bay of Bass Harbor providing a bird's eye view of tidal changes while you relax and enjoy the peace and quiet. Tides Cottage is a 2 bedroom 2 bath shore cottage that sleeps six in one queen, 2 twins and a double sleep sofa in the living area. 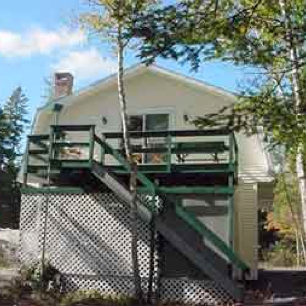 It is located on the tidal bay of Bass Harbor in a very quiet and peaceful setting. The vaulted ceilings, white washed pine walls, and glass front makes the living area very spacious and a perfect spot to relax and watch the changing of the tides. The beautiful front deck provides the perfect gathering place to enjoy the changing of the tides, or enjoy the peaceful surroundings. The Treehouse is a two bedroom, second-story apartment, 28 X 32, that sleeps six, (one queen, two twins plus a double sleep sofa that is located in the living area). The Treehouse is located in a quiet peaceful area with distant water views, and access to the shore just a short stroll down the driveway. The Boathouse is an efficiency cottage that accommodates two, located right at the water's edge on Hodgdon Pond . It has everything you could ask for in a romantic cottage getaway.